Bedford Lawn Bowls Club - Club News! On Friday October 6th at the Bedford Lawn Bowls Club, eleven bowlers took part in training to become Club Coaches at a NCCP Club Coach Workshop facilitated by Carolyn Ulch, LBNS Provincial Coaching Coordinator. These coaches were engaged in the course content which involved modules of learning in: Participant-centred Coaching, Explaining and Demonstrating Bowls Skills, Safety, Long-term Athlete Development, Making Ethical Decisions, Purposeful Games and Practice Planning. Congratulations and Welcome to the family of coaching: Richard Cobb (Bedford), Henry Ellsworth (Bedford), Doug McLearn (Bedford), Helen Brightman (Cobequid), Marlene Sears (Cobequid), Blaise Donovan (Dartmouth), Gordon Foster (Dartmouth), Sue Ellen Horne (Dartmouth), Ann Marie Siteman (Dartmouth), Mayumi Endo (St. Mary’s) and Dorothy Lynch (Wanderers). Thank you to Brenda Nearing and Carolyn Reeves, Club Coaches, from Bedford who spent the day helping to make the program run smoothly. Thank you to Bedford Lawn Bowls Club for hosting the workshop and for providing refreshments throughout the day. Success in Ontario!! 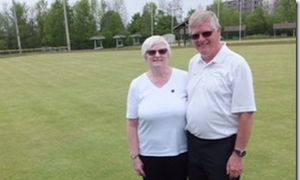 or "What I Did on my Spring Vacation"
Nora Clark tells us that she and her brother entered the Hollis Wealth Management Mixed Pairs Tournament held at Heritage Greens in Kitchener, Ontario in May. They won all 3 of their games in this invitational tournament, and placed second, on points, to Crystall Shephard (who incidentally had just been inducted into the OLBA Hall of Fame). Just a note to give you a heads up on where to look for resources to help you improve your skill level at Lawn Bowls. Practice Time: Practice time is available on Mondays during our season to allow you to improve your skills. club is open from 11:30 am to 1:00 pm. Also on evenings when the club play is not using all greens members can come to the club and practice on an open green. Drills: Google Lawn Bowls Coaching Drills and see if there are some skill development drills that you want to try. Reading: The New Bowler handbook and the Laws of the Sport of Bowls (15th edition) are excellent sources of material on the game of Lawn Bowls. Videos: There are a number of videos on line that you can watch to help you determine what you can do to improve your skill level. Some are available on the various club web sites within the province. If you go to our club web site http://bedfordlawnbowls.webs.com/ you will find links to the other clubs as well as the NS Lawn Bowls Association web page. Questions/Advise: The coaches, when not playing a game or involved with training other members, can be approached regarding aspects of the game you have an enquiry about. If the names and faces are not familiar to you look for the Red Name tag that the coaches have. Clinics: We are planning to hold two clinics this summer instead of the “Train To Play” version that we held last year. Reason for the change is that we have lost a large percentage of our coaches with available time to dedicate to this endeavor. More information coming on these as we develop the program. A Bus Station is where a bus stops ------ A Train Station is where a train stops ----- At my desk I have a work station. Volunteers are unpaid, not because they are worthless! The secret to making any club a success comes down to each individual club member's willingness to volunteer their time and efforts for the smooth running of the club activities and functions. REMEMBER we need you - to help set up and provide what is necessary for all events to take place. Your efforts will be greatly appreciated and will be what makes our club a success and an attraction for others!